A tale of friendship, family and magic in interwar New York. Ada and Corinne are best friends, keeping secrets from the world together and looking out for eachother in a situation fraught with danger. There is a creepy asylum with sinister overtones, gangsters, secret underground clubs and heists, all of which the teenagers are caught up in. Both Ada and Corinne are Hemopaths, meaning they can each use a different kind of art as magic to influence and manipulate people. We meet Hemopaths who are musicians, singers, actors and painters, and each uses their talent in different ways. It’s an usual form of magic, but it’s delightful and rather mysterious. Race: A book set in interwar America could not ignore the issue of race unless it wished to be considered an alternate reality. What Iron Cast does well is acknowledge those challenges, prejudices, and legal restrictions Ada experiences without letting them define her story. There are many wonderful books that delve into issues of race, but have young adult books which acknowledge the role race plays in life without making it the whole of that character’s story is important too. Ada is a talented musician, a wielder of magic, a loyal friend, and a shaper of her own destiny. Family: Iron Cast gets serious points with me for including parents! Too often parents are absent from YA novels, and it was refreshing to have protagonists with complicated but very real relationships with their parents, and to have the parents play a role in the plot. Understanding that parents are people can be one of the strangest experiences of young adult-hood and Iron Cast wove this in well. Plot: The biggest let down of this book was the plot. The pacing was very poorly executed and the structure of the narrative was too simplistic. I loved the characters so much and enjoyed getting to know them, so I was swept along and willing to forgive most of the weaknesses. But it did suffer from the lack of momentum that many debut novels seem have, as though the author became so attached to particular scenes that they remained even after they were not needed to progress the plot. 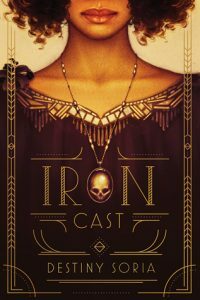 Overall the strength and depth of the characters in Iron Cast is what won me over. There was enough that was unique or at least delightful that I was able to set aside the issues I have with the pacing and some aspects of the plot.